More results from this week’s 50th Lunar and Planetary Science Conference in Texas! Two presentations today focused on showing the dramatic changes on the surface of Comet 67P/C-G that were documented by Rosetta. The first focused on the changes produced after massive outbursts during the comet’s closest approach to the Sun. The second documented several more evolutionary changes that changed more slowly. The image to the right comes from the first paper, and shows the changes that took place on the surface following one massive outburst, with the numbers in red indicating unchanged features between the two photographs. southern summer solstice with perihelion passage, the southern hemisphere is subjected to higher solar input, resulting in higher levels of activity and more intensive erosion. The location of the collapsing cliff in Sobek is consistent with the inferred source region of one of the strong outbursts [previously reported]. The paper also showed evidence of a large boulder more than a 100 feet across moving several hundred feet over a period of seven months. The second paper showed various changes in a number of depressions and scarps on the smooth flat surfaces near the narrow neck that connected the comet’s two lobes. Examples of this terrain can be seen in high resolution pictures here and here and here and here. From this data scientist suggest that the neck region is slowly dissolving away, its material in these flat areas flying away because the neck happens to be a region of low gravity. Scientists analyzing the data produced by Rosetta while it was flying in formation with Comet 67P/C-G have determined that the comet’s complex topology acted almost like nozzles to encourage evaporating material to form jets. The new study shows for the first time that mainly the unusual shape and jagged topography of the comet are responsible for this phenomenon. The researchers analyzed images at different observation geometries of the Hapi region located on the “neck” of the comet, the narrow part connecting its two lobes. In computer simulations, they were able to reproduce these images thus gaining a better understanding of the driving processes. In particular, two effects proved to be decisive. Some regions on the surface are located at lower altitudes or in the shade. The first rays of sunlight reach them later. In contrast, the frost evaporates particularly efficiently from the early and strongly illuminated regions. In addition, pits and other concave structures virtually concentrate gas and dust emissions – much like an optical lens. This means that predicting the evaporation patterns on other comets will require first obtaining a detailed map of the surface, showing both its topography and make-up. This also means that any future explorers will first have to send a robot scouting mission so that they can plan a safe arrival during active periods. A search by a Twitter user of the Rosetta archive from its visit to Comet 67P/C-G has produced a very short movie of the comet’s surface. The bright dots travelling from the top of the frame to the bottom, which look something like snow, are in fact background stars. They have that apparent motion as the spacecraft moves and the comet rotates. The more rapidly moving streaks are thought to be dust particles illuminated by the Sun. There also appear to be a few streaking cosmic rays. Take a look. The twelve second movie gives a flavor of what it would be like to walk that comet’s surface. NASA has narrowed its choice for a 2020s deep space planetary mission to two finalists, either a sample return mission to Comet 67P/C-G or a drone that would fly through Titan’s atmosphere. The sample return mission sounds very doable with today’s technology. The Titan drone mission however is far more intriguing. Dragonfly is a dual-quadcopter lander that would take advantage of the environment on Titan to fly to multiple locations, some hundreds of miles apart, to sample materials and determine surface composition to investigate Titan’s organic chemistry and habitability, monitor atmospheric and surface conditions, image landforms to investigate geological processes, and perform seismic studies. If it was up to me and I had unlimited funds, I’d go with Dragonfly. We know far less about the outer solar system, and this mission would be an ideal way to increase that knowledge. It is also far more daring, which carries the risk that the costs to build and launch will rise uncontrollably. A study of the dust released by Comet 67P/C-G and captured by Rosetta shows that carbon molecules appear to comprise the comet’s largest component, and that this material is found in the form of very large macromolecules. As the study shows, organic molecules are among those ingredients at the top of the list. These account for about 45 percent of the weight of the solid cometary material. “Rosetta’s comet thus belongs to the most carbon-rich bodies we know in the solar system,” says MPS scientist and COSIMA team member Dr. Oliver Stenzel. The other part of the total weight, about 55 percent, is provided by mineral substances, mainly silicates. It is striking that they are almost exclusively non-hydrated minerals i.e. missing water compounds. 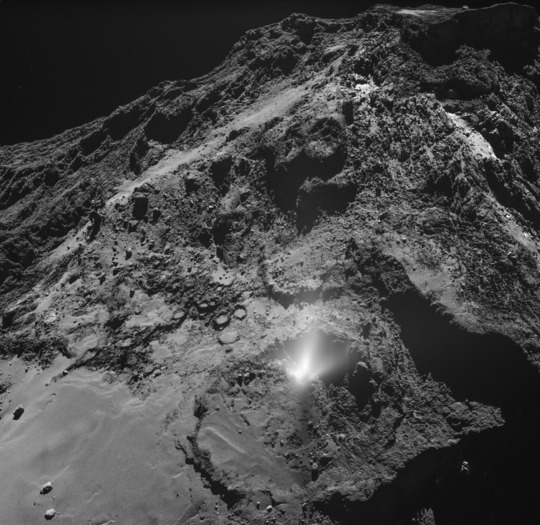 “Of course, Rosetta’s comet contains water like any other comet, too,” says Hilchenbach. “But because comets have spent most of their time at the icy rim of the solar system, it has almost always been frozen and could not react with the minerals.” The researchers therefore regard the lack of hydrated minerals in the comet’s dust as an indication that 67P contains very pristine material. …The current findings also touch on our ideas of how life on Earth came about. In a previous publication, the COSIMA team was able to show that the carbon found in Rosetta’s comet is mainly in the form of large, organic macromolecules. Together with the current study, it becomes clear that these compounds make up a large part of the cometary material. Thus, if comets indeed supplied the early Earth with organic matter, as many researchers assume, it would probably have been mainly in the form of such macromolecules. Organic here does not mean life, but is instead used as chemists use it, to mean the molecule includes the element carbon. The results do suggest however that the early solar system had a lot of carbon available, and that much of it was in a relatively pure form available to interact with other elements. Cool image time! The Rosetta science team has released images and data gathered in July 2016 when the spacecraft successfully observed a dust outburst erupting from Comet 67P/C-G’s surface. The image on the right, slightly reduced in resolution, shows that outburst. When the Sun rose over the Imhotep region of Rosetta’s comet on July 3, 2016, everything was just right: As the surface warmed and began to emit dust into space, Rosetta’s trajectory led the probe right through the cloud. At the same time, the view of the scientific camera system OSIRIS coincidentally focused precisely on the surface region of the comet from which the fountain originated. A total of five instruments on board the probe were able to document the outburst in the following hours. As should be expected, the results did not match the models or predictions. The jet, instigated by water-ice just below the surface turning into gas when heated by the Sun, was much dustier than predicted. They have theories as to why, but it appears that no one likes these theories that much. A new study released today describes in detail the many changes seen by scientists in the data collected by Rosetta during its two years in close proximity to Comet 67P/C-G. In the case of the boulder, Rosetta’s cameras observed a 282-million-pound (130-million-kilogram), 100-feet-wide (30-meter) space rock to have moved 150 yards (460 feet, or 140 meters) from its original position on the comet’s nucleus. The massive space rock probably moved as a result of several outburst events that were detected close to its original position. The warming of 67P also caused the comet’s rotation rate to speed up. The comet’s increasing spin rate in the lead-up to perihelion is thought to be responsible for a 1,600-foot-long (500-meters) fracture spotted in August 2014 that runs through the comet’s neck. The fracture, which originally extended a bit longer than the Empire State Building is high, was found to have increased in width by about 100 feet (30 meters) by December 2014. Furthermore, in images taken in June 2016, a new 500- to 1,000-foot-long (150 to 300 meters) fracture was identified parallel to the original fracture. It is almost a shame that Rosetta did not see that break-up. The images would have been breath-taking, and the science learned priceless. A comparison of Rosetta images before and after Comet 67P/C-G’s close approach to the sun last year found new fractures and an enlargement of older fractures. The fractures appear to be developing as forces subtly bend the comet to and fro, Stubbe Hviid, a planetary scientist at the German Aerospace Center Institute of Planetary Research in Berlin, reported October 17 in a press conference at a meeting of the American Astronomical Society’s Division for Planetary Sciences. Hviid and colleagues combined maps from Rosetta with computer simulations of all the forces at work within the comet to determine how the cracks develop. They found that the two bulbous ends rock in opposite directions as the comet spins, flexing the neck and creating severe stress. Because the comet isn’t held together strongly — it’s a conglomeration of dust and ice not much stickier than snow, Hviid said — the neck is starting to break. After a few hundred more years, he said, the comet could fold itself in half as the two lobes snap apart and smoosh together. The Rosetta mission has ended. The spacecraft worked up until it landed on the comet’s surface. The image on the right was the last image, taken from about 167 feet away with a resolution capable of seeing objects less than a quarter of an inch across. You can see a nice collection of approach images here. The Rosetta science team has released a summary of what they have learned about the interior of Comet 67P/C-G. Essentially, they have found that the comet’s interior has a rather uniform and soft and fluffy interior, with few voids or dense pockets. They also found that the comet’s two lobes almost certainly came from two different objects that somehow made contact and stuck to each other. And finally, it appears that the upper few feet of the surface of the smaller lobe where Philae landed is different than its interior, a difference likely caused by the surface’s exposure to the Sun. The Rosetta team has released a step-by-step outline on what will happen this week as Rosetta is sent crashing into Comet 67P/C-G, including details on how the public can watch. More information here. Coverage will begin at 6:30 am (Eastern) on September 30 and end a little over an hour later. The Rosetta science team has released a detailed analysis of the jets and outbursts that they observed coming from Comet 67P/C-G during the comet’s close approach to the Sun. Brief but powerful outbursts seen from Comet 67P/Churyumov–Gerasimenko during its most active period last year have been traced back to their origins on the surface. In the three months centred around the comet’s closest approach to the Sun, on 13 August 2015, Rosetta’s cameras captured 34 outbursts. These violent events were over and above regular jets and flows of material seen streaming from the comet’s nucleus. The latter switch on and off with clockwork repeatability from one comet rotation to the next, synchronised with the rise and fall of the Sun’s illumination. By contrast, outbursts are much brighter than the usual jets – sudden, brief, high-speed releases of dust. They are typically seen only in a single image, indicating that they have a lifetime shorter than interval between images – typically 5–30 minutes. A typical outburst is thought to release 60–260 tonnes of material in those few minutes. 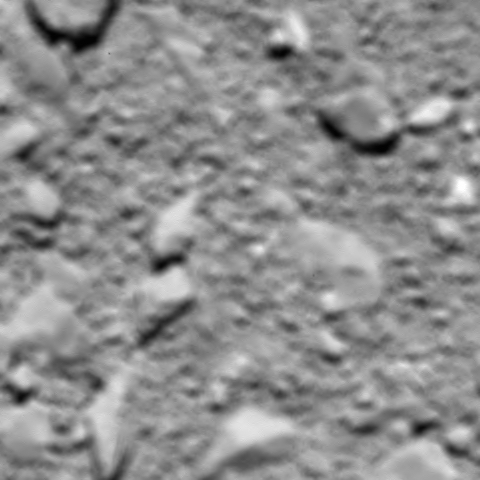 They have also released a new image taken by the navigation camera of Rosetta’s September 30th landing zone. The Rosetta team has released a detailed description of what will be happening in the last two weeks of the spacecraft’s mission, leading up to its landing on the comet’s surface on September 30. Their description of the difficulty of planning maneuvers based on the complex asymmetrical gravitational field of the two-lobed comet nucleus is especially interesting. The Rosetta science team today posted two stories, describing details about the planned final descent of the spacecraft to the surface of Comet 67P/C-G on September 30, ending the mission. The spacecraft will land in a region dubbed Ma’at that contains several active pits more than 300 feet across and 150 feet deep. This is also where several of the comets dust jets originate. The Rosetta science team has announced that they have detected very complex carbon molecules in solid dust particles that were released from Comet 67P/C-G.
“Our analysis reveals carbon in a far more complex form than expected,” remarked Hervé Cottin, one of the authors of the paper reporting the result that is published in Nature today. “It is so complex, we can’t give it a proper formula or a name!” The organic signatures of seven particles are presented in the paper, which the COSIMA team say are representative of the two hundred plus grains analysed so far. The carbon is found to be mixed with other previously reported elements such as sodium, magnesium, aluminium, silicon, calcium and iron. It is bound in very large macromolecular compounds similar to the insoluble organic matter found in carbonaceous chondrite meteorites that have fallen to Earth, but with a major difference: there is much more hydrogen found in the comet’s samples than in meteorites. But as this kind of meteorite is associated with reasonably well-processed parent bodies such as asteroids, it is reasonable to assume that they lost their hydrogen due to heating. By contrast, comets must have avoided such significant heating to retain their hydrogen, and therefore must contain more primitive material. Because of the use of the term organics here for these carbon-based molecules, expect a lot of news reports to misreport this discovery and incorrectly announce with great excitement that Rosetta has “discovered life” on Comet 67P/C-G! Among scientists, any carbon molecule is referred to as organic, even if it is entirely inanimate. In this case these molecules are not the result of life, but of carbon’s atomic structure, allowing it to form an infinite variety of molecules with almost any other element. Less than a month before Rosetta’s mission ends the spacecraft’s high resolution camera has finally located Philae in its final resting spot on the surface of Comet 67P/C-G. The images were taken on 2 September by the OSIRIS narrow-angle camera as the orbiter came within 2.7 km of the surface and clearly show the main body of the lander, along with two of its three legs. 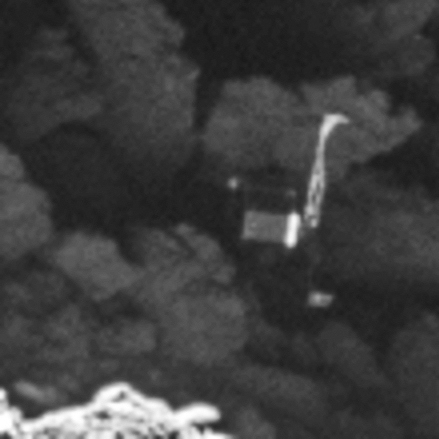 The images also provide proof of Philae’s orientation, making it clear why establishing communications was so difficult following its landing on 12 November 2014. The image on the right clearly shows the lander on its side with one leg sticking up, as theorized by the Rosetta engineers based on the small amount of data they had received before Philae went dead. Furthermore, the wide image at the link above shows that the lander landed exactly as predicted by data, up against a wall — in this case a large boulder — which placed it in shadow most of the time. In anticipation of the end of the Rosetta mission at the end of this month on September 30, the Rosetta science team has produced an excellent video, embedded below, providing a good summary of the mission and what it learned. Cool image time! 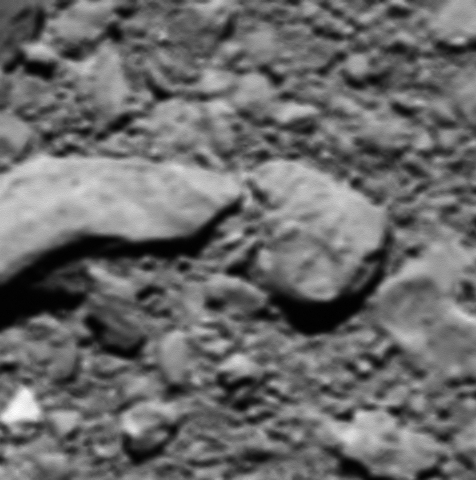 Below the fold are two images taken by Rosetta of the smooth boulder-strewn area on Comet 67P/C-G called Imhotep, which has been featured many times by the Rosetta science team. The image on the left was taken October 26, 2014 soon after the spacecraft’s arrival at the comet. The image on the right was taken August 17, 2016, almost two years later after it had completed its close approach to the Sun. With both images I have cropped them and reduced their resolution to fit here. With the more recent image I have also stretched it horizontally to better match it to the older image. The point? The giant boulders on this smooth region act as markers so that we can more easily compare the region and see how it has changed with time. The newer image clearly shows a loss of material from the surface, with the depressions in the smooth areas having grown much larger and in some areas much deeper. At the same time, there has been a softening in some of the edges between the lower and higher areas, especially in the middle of the smooth region. What will happen here in the future? It appears that the smooth area is actually pond of dust that is slowly evaporating away with each close approach to the Sun, leaving behind the solid bedrock pinnacles within it that only appear as boulders because they are mostly buried. Eventually, when the dust is gone, some of those pinnacles will break away as well. The Rosetta science team today released data and images of a February 19, 2016 outburst on Comet 67P/C-G that the spacecraft was able to photograph, as it happened. A strong brightening of the comet’s dusty coma was seen by the OSIRIS wide-angle camera at 09:40 GMT, developing in a region of the comet that was initially in shadow. Over the next two hours, Rosetta recorded outburst signatures that exceeded background levels in some instruments by factors of up to a hundred. For example, between about 10:00–11:00 GMT, ALICE saw the ultraviolet brightness of the sunlight reflected by the nucleus and the emitted dust increase by a factor of six, while ROSINA and RPC detected a significant increase in gas and plasma, respectively, around the spacecraft, by a factor of 1.5–2.5. In addition, MIRO recorded a 30ºC rise in temperature of the surrounding gas. Shortly after, Rosetta was blasted by dust: GIADA recorded a maximum hit count at around 11:15 GMT. Almost 200 particles were detected in the following three hours, compared with a typical rate of 3–10 collected on other days in the same month. 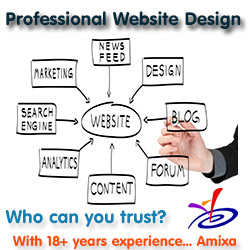 Be sure an look at the animated gif at the link. Many cool images! 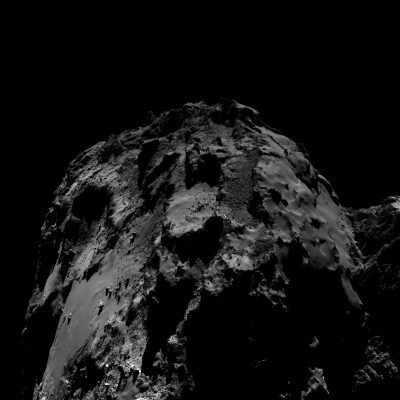 The Rosetta team has released a bunch of very nice images taken of Comet 67P/C-G during August when the spacecraft was flying in close. The image on the right, cropped and reduced in resolution to post here, shows the comet’s large lobe, with the narrow neck to the left. Make sure you check out the full resolution image. It was taken on August 10, 2016 from about 8 miles away, and has a resolution of less than four feet per pixel. If a person was standing there you could just see them! What I find most fascinating is the incredible curvature of the comet’s surface. The smooth area on the left, dubbed Imhotep (images of which have been posted here previously), has several big boulders on its flat surface. If you stood there, the ground would be down and horizontal. Walk only a short distance and you quickly reach the curving horizon and that flat area would look like a steep slope dropping down behind you. Yet, the boulders do not roll down hill! Walk a short distance more and you begin to enter the neck region, with giant walls rising above you, until you start to walk up them and they become the floor! Using the data from Rosetta, scientists have developed a detailed scenario for the birth process that created Comet 67P/C-G.
During its two-year sojourn at Comet 67P/Churyumov–Gerasimenko, Rosetta has revealed a picture of the comet as a low-density, high-porosity, double-lobed body with extensive layering, suggesting that the lobes accumulated material over time before they merged. In other words, the comet’s two lobes formed slowly as separate bodies but always in the same general region, and then moved closer and closer together until they gently merged. Based on this scenario, Comet 67P/C-G had to have formed very early in the solar system, and also was not in the inner solar system — as it is now — when the great early bombardment occurred there about a billion years ago. The Rosetta science team has decided to shut off tomorrow the communications equipment the spacecraft uses in its continuing attempts to re-establish communications with its Philae lander. Switching off the ESS is part of the preparations for Rosetta’s end of mission. By the end of July 2016, the spacecraft will be some 520 million km from the Sun, and will start facing a significant loss of power – about 4W per day. In order to continue scientific operations over the next two months and to maximise their return, it became necessary to start reducing the power consumed by the non-essential payload components on board. Though until now they have never stopped trying to contact Philae, they have heard nothing since July 2015. Moreover, the recent close sweeps down to the comet’s surface have failed so far to locate the lander. Unless they are holding back the lander’s discovery for a big splash press conference, it appears that we will never known exactly where the lander touched down. That is, we will never know. Someday, many decades in the future, some asteroid/comet mining operation will show up and find it. I hope at that time they will carefully pack it up and bring it back for humans to admire as a testament to our human ability to push the unknown. Even better, I hope they put it in the “History of Space” museum, located not on Earth but on Mars, built to educate the children of the colonists who are making possible the expansion of humanity out to the stars. 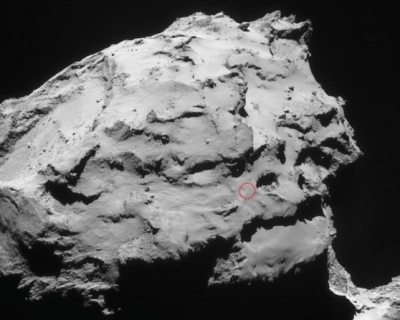 The Rosetta science team has chosen the spacecraft’s landing site on Comet 67P/C-G. The picture on the right shows this region, dubbed Ma’at, located on the comet’s smaller lobe. I also note that this decision makes no mention of Philae, and that there has been no word from the scientists on whether their recent close-up imagery of the comet has located the lander. I had hoped that they would find it and then aim the final descent toward it, but this apparently is not happening. The Rosetta science team today released to the public another set of high resolution images of Comet 67P/C-G. The more than 4,000 images include a set that shows Rosetta’s shadow moving across the comet’s surface. During Rosetta’s recent close approaches to Comet 67P/C-G scientists were able to confirm the presence of two noble gases, krypton and xenon. Rosetta had already detected argon, which makes three of the six noble gases. The Rosetta science team wants your help! The scientists running Rosetta are asking the public to help them pour through the more than 20,000 images of Comet 67P/C-G to identify any changes the comet has undergone since the spacecraft’s arrival. Because Rosetta’s star tracker became confused by dust particles, the spacecraft lost contact with Earth, went into safe mode, and required the entire weekend for engineers to regain control. “We lost contact with the spacecraft on Saturday evening for nearly 24 hours,” says Patrick Martin, ESA’s Rosetta mission manager. “Preliminary analysis by our flight dynamics team suggests that the star trackers locked on to a false star – that is, they were confused by comet dust close to the comet, as has been experienced before in the mission.” This led to spacecraft pointing errors, which triggered the safe mode. Unfortunately the star trackers then got hung in a particular sub mode requiring specific action from Earth to recover the spacecraft. The spacecraft has been diving to within only a few miles of the surface of Comet 67P/C-G, which means it is flying close to the comet’s coma. The increased dust in that region has confused the star tracker in the past, but this appears to have been the most serious event yet. Rosetta’s scientists have detected the amino acid glycine as well as other organic molecules in the atmosphere of Comet 67P/C-G.
Glycine is very hard to detect due to its non-reactive nature: it sublimates at slightly below 150°C, meaning that little is released as gas from the comet’s surface or subsurface due to its cold temperatures. “We see a strong correlation of glycine to dust, suggesting that it is probably released from the grains’ icy mantles once they have warmed up in the coma, perhaps together with other volatiles,” says Altwegg. At the same time, the researchers also detected the organic molecules methylamine and ethylamine, which are precursors to forming glycine. Unlike other amino acids, glycine is the only one that has been shown to be able to form without liquid water. “The simultaneous presence of methylamine and ethylamine, and the correlation between dust and glycine, also hints at how the glycine was formed”, says Altwegg.